Muhammad Ali, the Louisville-born boxing champion who inspired love and hate — and finally became a global symbol of peace and reconciliation — died Friday following respiratory complications. He was 74. In Louisville, Mayor Greg Fischer ordered flags at all city government buildings to be lowered to half-staff and remain so until he is laid to rest. Ali’s funeral took place in Louisville, KY on Friday. It included a motorcade through the city, private burial at Cave Hill cemetery and a public memorial at the KFC Yum! Center with eulogies by former President Bill Clinton, Billy Crystal and Bryant Gumbel. The funeral plans were made years ago based on Ali’s wishes- he wanted the memorial to be “open to everyone”. Over the years, his family has taken great pains to shield the champion’s declining health. But, after it became clear this week that his condition wasn’t going to improve, the entire family was able to make it to the Scottsdale-area hospital during his final 24 hours, to say goodbye. The boxing great officially died of septic shock from unspecified natural causes on Friday at 9:10 p.m. mountain time. Ali did not suffer. Even as his health declined, Ali appeared as late as 2015 at award ceremonies and fundraisers, and in recent years made visits to Louisville’s Muhammad Ali Center, a museum opened in 2005 to celebrate his life and carry on his humanitarian efforts. While Ali and his family recently kept homes in Louisville and the Phoenix area, he was as much a citizen of the world — often called the most recognizable person on Earth. And that was part of the reason the family wanted to have a celebration and a memorial service that was open to everyone, from all walks of life. Originally known as Cassius Clay, Ali was the first man to win the world heavyweight title three times, the first at 22 with an electrifying upset of 7-1 favorite, Sonny Liston in 1964. 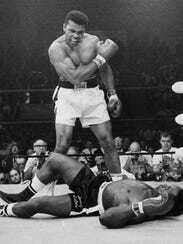 The next day he announced his conversion to Islam and soon after shared his new name, Muhammad Ali. While his legal appeal made its way through the courts, he stayed out of prison AND out of the ring (from 1967-70). His conviction was eventually overturned by the U.S. Supreme Court in 1971. After returning to the ring, he was a different fighter, his speed and reflexes had diminished. He defeated Gerry Cooney in Atlanta in 1970 but then suffered his first loss, to Joe Frazier, in 1971. He would fight 61 times in the ring and win 56 times- 37 of them by KO (knock out). RIP Muhammad Ali. You will be missed. The family has requested that any donations or gifts be made to the Muhammad Ali Center: alicenter.org. PreviousFDA Approves Candy-Flavored Amphetamines for Kids?